For the BBC television network, see BBC World News. "World Service" redirects here. For the albums, see World Service (Spear of Destiny album) and World Service (Delirious? album). The BBC World Service is the world's largest international broadcaster, broadcasting radio and television news, speech and discussions in 29 languages to many parts of the world on analogue and digital shortwave platforms, Internet streaming, podcasting, satellite, FM and MW relays. It was announced in November 2016 that The BBC World Service will start broadcasting in Igbo, Nigerian Pidgin, Yoruba and Amharic among others in its biggest expansion since the 1940s. The World Service reached 210 million people a week (TV, radio and online) on average in 2015. The English-language service broadcasts 24 hours a day. The World Service is funded by the United Kingdom's television licence fee, limited advertising and the profits of BBC Worldwide Ltd. The service will also get GBP289 million from the UK government from 2016-2020. The World Service was funded for decades by grant-in-aid through the Foreign and Commonwealth Office of the British Government until 1 April 2014. The BBC World Service began as the BBC Empire Service in 1932 as a shortwave service aimed principally at English speakers in the outposts of the British Empire. In his first Christmas Message, King George V stated that the service was intended for "men and women, so cut off by the snow, the desert, or the sea, that only voices out of the air can reach them." First hopes for the Empire Service were low. The Director General, Sir John Reith (later Lord Reith) said in the opening programme: "Don't expect too much in the early days; for some time we shall transmit comparatively simple programmes, to give the best chance of intelligible reception and provide evidence as to the type of material most suitable for the service in each zone. The programmes will neither be very interesting nor very good." This address was read out five times as it was broadcast live to different parts of the world. On 3 January 1938, the first foreign-language service, Arabic, was launched. German programmes commenced on 29 March 1938 and by the end of 1942 broadcasts were being made in all major European languages. As a result, the Empire Service was renamed the BBC Overseas Service in November 1939, and a dedicated BBC European Service was added in 1941. These broadcasting services, financed not from the domestic licence fee but from government grant-in-aid (from the Foreign Office budget), were known administratively as the External Services of the BBC. By the end of the 1940s the number of languages broadcast had expanded and reception had improved following the opening of a relay in modern-day Malaysia and of the Limassol relay, Cyprus, in 1957. On 1 May 1965 the service took its current name of BBC World Service and the service itself expanded its reach with the opening of the Ascension Island relay in 1966, serving African audiences with greater signal and reception, and the later relay on the Island of Masirah. In August 1985, the service went off the air for the first time when workers went on strike in protest at the British government's decision to ban a documentary featuring an interview with Martin McGuinness of Sinn Féin. The External Services were renamed under the BBC World Service brand in 1988. On 25 October 2005 it was announced that the Bulgarian, Croatian, Czech, Greek, Hungarian, Kazakh, Polish, Slovak, Slovene and Thai language radio services would end by March 2006 to finance the launch of Arabic- and Persian-language TV news channels in 2007. Additionally, Romanian broadcasts ceased on 1 August 2008. More service closures came in January 2011 when the closing of five language services was announced as a result of the financial situation the corporation was facing following the eventual financial transfer of responsibility for the World Service from the Foreign Office to the BBC licence fee. The Albanian, Macedonian, Portuguese for Africa, Serbian, and English for the Caribbean services were closed; the Russian, Ukrainian, Mandarin Chinese, Turkish, Vietnamese, Azeri and Spanish for Cuba services ceased broadcasting a radio service and the Hindi, Indonesian, Kyrgyz, Nepali, Swahili, Kinyarwanda and Kirundi services ceased transmission on the shortwave band. The British government announced that the three Balkan countries had luxuriant access to international information and continuation of broadcast in the local tongues had become unnecessary. 650 jobs went as part of the cuts and the service is facing a sixteen per cent budget cut. In March 2011 The Guardian published an article concerning an agreement between BBC Media Action (the BBC's broadcasting development charity) and the US State Department, in which the latter would provide the charity with a "low six-figure" sum so that new technology could be developed that would stop jamming, and to educate people on how to avoid state censorship should they want to. However, the agreement has caused accusations that these measures would encourage a pro-American bias within the service and would help America win the 'Information War'. The BBC World Service broadcasts from Broadcasting House in London, headquarters of the corporation as a whole. The service is located in the new constructions of the building and contains radio and television studios for use by the several language services. The building also contains an integrated newsroom used by the international World Service, the international television channel BBC World News, the domestic television and radio BBC News bulletins, the BBC News Channel and the BBC Website service to the World Wide Web. Upon launch, the service was located, along with nearly all Radio output, in Broadcasting House. 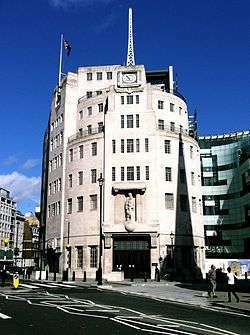 However, following the explosion of a parachute mine outside the building on 8 December 1940, the services relocated to new premises away from the likely target of Broadcasting House. The Overseas service relocated to premises in Oxford Street while the European service moved temporarily to the emergency broadcasting facilities at Maida Vale Studios. The European services moved permanently into Bush House towards the end of 1940, completing the move in 1941, with the Overseas services joining them in 1958. Bush House subsequently became the home of the BBC World Service and the building itself has gained a global reputation with the audience of the service. However, the building was vacated in 2012 as a result of the Broadcasting House changes and the end of the building's lease that year; the first service to move was the Burmese Service on 11 March 2012 and the final broadcast was a news bulletin broadcast at 11.00GMT on 12 July 2012. The BBC World Service is used to describe an English 24-hour global radio network and separate services in 27 languages. News and information is available on all these languages on the BBC website with many having RSS feeds and specific versions for use on mobile phones and some also offering email notification of stories. In addition to the English service, 18 of the language services broadcast a radio service using the Short wave, AM or the FM band. These programmes are also available to listen live over the Internet, can be listened to again over the Internet for seven days or indefinitely in some cases and, in the case of seven language services, can be downloaded as podcasts. One can also listen to the news from the BBC News app, which is available on both iTunes and the Google Play Store. In recent years, video content has also been used by the World Service; 16 language services now show video reports in that language on the service's website and two services now have dedicated television channels – BBC Arabic launched in 2008 and BBC Persian launched in 2009. Television services are also used to broadcast the radio service, with local cable and satellite television operators providing the English network and occasionally some local language services free to air on their services. The English language service is also available on digital radio in the UK and Europe. Traditionally, the BBC World Service relied on shortwave broadcasts, because of its ability to overcome barriers of censorship, distance and spectrum scarcity. To this end, the BBC has maintained a worldwide network of shortwave relay stations since the 1940s, mainly in former British colonies. These cross border broadcasts have also been used in special circumstances to broadcast emergency messages to British subjects abroad, such as the advice to evacuate Jordan during the Black September incidents of September 1970. These facilities were privatised in 1997 as Merlin Communications, which were later acquired and operated as part of a wider network for multiple broadcasters by VT Communications (now part of Babcock International Group). It is also common for BBC programmes to air on traditionally Voice of America or ORF transmitters, while their programming is relayed by a station physically located in the UK. However, since the 1980s, satellite distribution has made it possible for local stations to relay BBC programming. The World Service aims to be "the world's best-known and most-respected voice in international broadcasting, thereby bringing benefit to the UK, the BBC and to audiences around the world" while retaining a "balanced British view" of international developments. Like the rest of the BBC, the World Service is a Crown corporation of the UK Government. Until 2014, unlike the rest of the corporation, which is funded through a television licence fee, the World Service was funded through a Parliamentary grant-in-aid given by the Foreign and Commonwealth Office. In 2008/9 the BBC World Service received 12.4% of the department's £2.2 billion budget and in the financial year 2011/12, the service received £255.2 million from this grant. In addition to broadcasting, the BBC World Service also devotes resources to the BBC Learning English programme which helps people learn English. The World Service has previously operated a number of different language services, targeted to different audiences. The table lists all of the current and former language services and when they operated. The World Service in English mainly broadcasts news and analysis programmes. The mainstays of the current BBC World Service schedule are Newsday, World Update, Newshour and The Newsroom. There are daily science programmes: Health Check, the technology programme Click and Science in Action. At the weekends, some of the schedule is taken up by Sportsworld, which often includes live commentary of Premier League football matches. Other weekend sport shows include The Sports Hour and Stumped, a cricket partnership with All India Radio and The Australian Broadcasting Corporation. On Sundays the international, interdisciplinary discussion programme The Forum is broadcast. On weekdays, an hour of the schedule is given over to World: Have Your Say which encourages listeners to participate in discussing current events via text message, phone calls, emails and blog postings. Outlook, a human interest programme presented by Matthew Bannister and Jo Fidgen. It was first broadcast in July 1966 and presented for more than thirty years by John Tidmarsh. Regular music programmes were reintroduced with the autumn schedule in 2015. Many programmes, particularly speech-based ones, are also available as podcasts. Since the late 1990s, the focus of the station has been as a news network, with news bulletins added every half-hour following the outbreak of the Iraq War. News is the core of World Service scheduling. It is almost always transmitted at one minute past the hour, where there is a five-minute bulletin, and on the half-hour where there is a two-minute summary. Sometimes these bulletins are separated from the programmes being transmitted, whilst at other times they are integral to the programme (such as with The Newsroom, Newshour or Newsday). As part of the BBC's policy for breaking news, the BBC World Service is the first service to receive a full report for foreign news. The station also publishes a Global News podcast twice a day (once on weekends), usually around 30 minutes in length. The podcast is comparable to an edition of The Newsroom but without the five-minute newscast. Between 2007 and 2015 the podcast was downloaded more than 300 million times. The BBC World Service employs a team of 7 staff announcer/newsreaders. The BBC World Service website lists more than 80 FM stations in Africa which broadcast BBC content. The BBC World Service broadcasts a few hours in the morning and evening on shortwave to Africa from Ascension Island, South Africa, the UK, Madagascar and the UAE. Broadcasts have traditionally come from the UK, Cyprus, the large BBC Atlantic Relay Station on Ascension Island, and the smaller Lesotho Relay Station and Indian Ocean Relay Station on Seychelles. A large part of the English schedule is taken up by specialist programming from and for Africa, for example Focus on Africa and Africa, Have Your Say. In the 1990s, the BBC added FM facilities in many African capital cities. BBC World Service is available by subscription to Sirius XM's satellite radio service in the United States. Its Canadian affiliate, Sirius XM Canada does the same in Canada. More than 300 public radio stations across the US carry World Service news broadcasts —mostly during the overnight and early-morning hours— over AM and FM radio, distributed by American Public Media (APM). Listeners can also call a US phonenumber to listen to a live stream: 712-432-6580. The BBC and Public Radio International (PRI) co-produce the programme The World with WGBH Radio Boston, and the BBC was previously involved with The Takeaway morning news programme based at WNYC in New York City. BBC World Service programming also airs as part of CBC Radio One's CBC Radio Overnight schedule in Canada. BBC shortwave broadcasts to this region were traditionally enhanced by the Atlantic Relay Station and the Caribbean Relay Company, a station in Antigua run jointly with Deutsche Welle. In addition, an exchange agreement with Radio Canada International gave access to their station in New Brunswick. However, "changing listening habits" led the World Service to end shortwave radio transmission directed to North America and Australasia on 1 July 2001. A shortwave listener coalition formed to oppose the change. The BBC broadcasts to Central America and South America in several languages. It is possible to receive the Western African shortwave radio broadcasts from eastern North America, but the BBC does not guarantee reception in this area. It has ended its specialist programming to the Falkland Islands but continues to provide a stream of World Service programming to the Falkland Islands Radio Service. For several decades, the World Service's largest audiences have been in Asia, the Middle East, Near East and South Asia. Transmission facilities in the UK and Cyprus have been supplemented by the former BBC Eastern Relay Station in Oman and the Far Eastern Relay Station in Singapore. The East Asian Relay Station moved to Thailand in 1997 when Hong Kong was handed over to Chinese sovereignty. Together, these facilities have given the BBC World Service an easily accessible signal in regions where shortwave listening has traditionally been popular. The English shortwave frequencies of 6195, 9740, 15310/360 and 17790/760 kHz are widely known. The largest audiences are in English, Hindi, Urdu, Nepali, Bengali, Tamil, Sinhala and other major languages of South Asia, where BBC broadcasters are household names. The Persian service is the de facto national broadcaster of Afghanistan, along with its Iranian audience. The World Service is available up to eighteen hours a day in English across most parts of Asia, and in Arabic for the Middle East. With the addition of relays in Afghanistan and Iraq these services are accessible in most of the Middle and Near East in the evening. 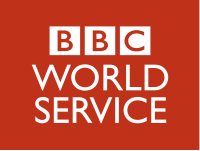 In Hong Kong and Singapore, the BBC World Service in English is essentially treated as a domestic broadcaster, easily available 24/7 through long-term agreements with Radio Television Hong Kong and MediaCorp Radio. In the Philippines, DZRJ 810 AM broadcasts the BBC World Service in English from 12:00–05:00 PHT (GMT+8). Although this region has seen the launch of the only two foreign language television channels, several other services have had their radio services closed as a result of budget cuts and redirection of resources. Japan and Korea have little tradition of World Service listening, although during the 1970s to 1980s, shortwave listening was popular in Japan. In those two countries, the BBC World Service was only available via shortwave and the Internet. As of September 2007, a satellite transmission (subscription required) became available by Skylife (Channel 791) in South Korea. In November 2016, the BBC World Service announced it plans to start broadcasts in Korean. The Soviet Union, Iran, Iraq and Myanmar/Burma have all jammed the BBC in the past. Mandarin was heavily jammed by the People's Republic of China until short wave transmissions for that service ceased but China continues to jam transmissions in Uzbek and has since started to jam transmissions in English throughout Asia. The BBC World Service is broadcast in Berlin on 94.8 MHz. FM relays are also available in Ceske Budjovice, Karlovy Vary, Plzen Usti nad Labem, Zlin and Prague in the Czech Republic, Riga, Tirana and Vilnius. A BBC World Service channel is available on DAB+ in Brussels and Flanders. The World Service employed a medium wave transmitter at Orford Ness to provide English-language coverage to Europe, including on the frequency 648 kHz (which could be heard in parts of the south-east of England). Transmissions on this frequency were stopped on 27 March 2011, as a consequence of the budgetary constraints imposed on the BBC World Service in the 2010 budget review. A second channel (1296 kHz) traditionally broadcast in various Central European languages, but in 2005 it began regular English-language transmissions via the Digital Radio Mondiale (DRM) format. This is a digital shortwave technology that VT expects to become the standard for cross-border transmissions in developed countries. In the 1990s, the BBC purchased and constructed large medium wave and FM networks in the former Soviet bloc, particularly the Czech (BBC Czech Section), Slovak Republics (BBC Slovak Section), Poland (BBC Polish Section) (where it was a national network) and Russia (BBC Russian Service). It had built up a strong audience during the Cold War, whilst economic restructuring made it difficult for these governments to refuse Western investment. Many of these facilities have now returned to domestic control, as economic and political conditions have changed. On Monday 18 February 2008, the BBC World Service stopped analogue shortwave transmissions to Europe. The notice stated, "Increasing numbers of people around the world are choosing to listen to radio on a range of other platforms including FM, satellite and online, with fewer listening on shortwave." It is sometimes possible to pick up the BBC World Service in Europe on SW frequencies targeted at North Africa. The BBC's powerful 198 kHz LW, which broadcasts the domestic BBC Radio 4 to Britain during the day (and carries the World Service during the night) can also be heard in nearby parts of Europe, including the Republic of Ireland, the Netherlands, Belgium and parts of France, Germany and Scandinavia. In Malta, BBC News bulletins are carried by a number of radio stations, including Radju Malta and Magic 91.7 owned by national broadcaster PBS Ltd. These are broadcast at various points in the day and supplement news bulletins broadcast in Maltese from the PBS Newsroom. Former BBC shortwave transmitters are located in the United Kingdom at Rampisham, Woofferton and Skelton. The former BBC East Mediterranean Relay Station is in Cyprus. The World Service is available as part of the subscription Digital Air package (available from Foxtel and Austar) in Australia. ABC NewsRadio, SBS Radio, and various community radio stations also broadcast many programmes. Many of these stations broadcast a straight feed during the midnight to dawn period. It is also available via the satellite service Optus Aurora, which is encrypted but available without subscription. In Sydney, Australia a transmission of the service can be received at 152.025 MHz. It is also available on the DAB+ Network in Australia on SBS Radio 4 (Except during Eurovision and special events). 2MBS-FM 102.5, a classical music station in Sydney, also carries the BBC World Service news programmes at 7am and 8am on weekdays, during its 'Music for a New Day' breakfast programme. Shortwave relays from Singapore (see Asia, above) continue, but historic relays via Australian Broadcasting Corporation (ABC) and Radio New Zealand International were wound down in the late 1990s. BBC World Service relays on Radio Australia now carry the BBC Radio news programmes. In the Pacific and New Zealand, the Auckland Radio Trust operates a BBC World Service network as a non-profit donation-funded public broadcaster. It broadcasts on 810 kHz in Auckland, 107.0 MHz in Whitianga and Whangamata, 107.3 MHz in the Kaipara Harbour, 88.2 MHz in Suva and Nadi, 100.0 MHz in Bairiki and Tarawa, 101.1 MHz in Pohnpei, 107.6 MHz in Port Moresby, 105.9 MHz in Honiara, 99.0 MHz in Port Vila and Luganville, and 100.1 MHz in Funafuti. The station also broadcasts local content. In New Zealand, Radio Tarana and members of the Association of Community Access Broadcasters carry some BBC World Service programmes. The BBC World Service was previously available on 1233 kHz in Wellington between 1990–1994, and again from 1996–1997. The BBC World Service is broadcast on DAB, Freeview, Virgin Media and Sky platforms. It is also broadcast overnight on the frequencies of BBC Radio 4 following the latter's closedown at 0100 British time. The BBC World Service does not receive funding for broadcasts to the UK. In southeast England, the station could be picked up reliably on medium wave 648 kHz, which was targeted at mainland Europe. The medium wave service was closed in 2011 as a cost-cutting measure. A previous BBC World Service signature tune and an example of a top-of-the-hour announcement. The World Service uses several tunes and sounds to represent the station. A previous signature tune of the station was a five note motif, composed by David Arnold and which comprises a variety of voices declaim "This is the BBC in..." before going on to name various cities (e.g. Kampala, Milan, Delhi, Johannesburg), followed by the station's slogan and the Greenwich Time Signal. This was heard throughout the network with a few variations – in the UK the full service name was spoken whereas just the name of the BBC was used outside the UK. The phrase "This is London" was used previously in place of a station slogan. The tune Lillibullero is another well known signature tune of the network following its broadcast previously as part of the top-of-the-hour sequence. This piece of music is still heard before certain bulletins and as a shortened version elsewhere, but it is used less often than previously. The use of the tune has gained some controversy because of its background as a Protestant marching song in Northern Ireland. In addition to these tunes, the BBC World Service also uses several interval signals. The English service uses a recording of the Bow Bells, made in 1926 and used a symbol of hope during the Second World War, only replaced for a brief time during the 1970s with the tune to the nursery rhyme Oranges and Lemons. The morse code of the letter "V" has also been used as a signal and was introduced in January 1941 and had several variations including timpani, the first four notes of Beethoven's Fifth Symphony (which coincide with the letter "V"), and electronic tones which until recently remained in use for some Western European services. In other languages, the interval signal is three notes, pitched B–B-C. However, these symbols have been used less frequently. The network operates using GMT, regardless of the time zone and time of year, and is announced on the hour on the English service as "13 hours Greenwich Mean Time" (1300 GMT) or "Midnight Greenwich Mean Time" (0000 GMT). The BBC World Service traditionally broadcasts the chimes of Big Ben in London at the start of a new year. ↑ "Microsoft Word - The Work of the BBC World Service 2008-09 HC 334 FINAL.doc" (PDF). Retrieved 16 February 2011. 1 2 3 "BBC World Service gets funding boost from government". bbc.com. BBC. Retrieved 24 November 2015. ↑ "BBC's combined global audience revealed at 308 million". BBC. 2015-05-15. Retrieved 2016-02-13. ↑ "BBC World Service (BBCWS), The UK's Voice around the World". BBC. Archived from the original on 1 November 2006. ↑ "About Us: BBC World Service". British Foreign & Commonwealth Office. 22 October 2010. Retrieved 9 January 2011. ↑ Repa, Jan (25 October 2005). "Analysis: BBC's voice in Europe". BBC News. Retrieved 16 July 2012. 1 2 "Historic moments from the 1930s". BBC World Service. Retrieved 16 July 2012. ↑ West, W. J., ed. (1985). Orwell: The War Broadcasts. Duckworth & Co/BBC. ISBN 0-563-20327-7. ↑ West, W. J., ed. (1985). Orwell: The War Commentaries. Duckworth & Co/BBC. ISBN 978-0-563-20349-0. ↑ "Historic moments from the 1940s". BBC World Service. Retrieved 16 July 2012. ↑ "The 1960s". BBC World Service. Retrieved 25 April 2010. 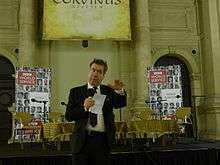 ↑ "BBC East Europe voices silenced". BBC News. 21 December 2005. Retrieved 18 July 2012. ↑ "BBC World Service to cut five language services". BBC News. 26 January 2011. Retrieved 18 July 2012. ↑ "BBC World Service cuts outlined to staff". BBC News. 26 January 2011. Retrieved 18 July 2012. ↑ Plunkett, John (26 January 2011). "BBC World Service to 'cut up to 650 jobs'". The Guardian. Retrieved 18 July 2012. ↑ Dowell, Ben (20 March 2011). "BBC World Service to sign funding deal with US state department". The Guardian. London. ↑ "BBC World Service and US State Department: new partners, new bias?". RT (Russia Today). 23 March 2011. Archived from the original on 31 May 2011. Retrieved 18 July 2012. ↑ "BBC World Service to sign funding deal with US state department". Retrieved 20 March 2011. ↑ "BBC World Service and US State Department: new partners, new bias?". Retrieved 26 November 2013. ↑ "American anger at BBC World Service Trust's bid for US funding". Retrieved 22 March 2011. 1 2 Thomas, Ronan. "BBC Broadcasting House". West End at War.org.uk. Retrieved 18 July 2012. 1 2 3 "Why is the HQ called Bush House?". Frequently Asked Questions. BBC World Service. Retrieved 18 July 2012. 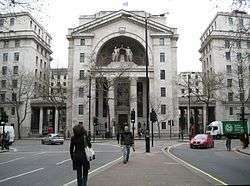 ↑ "BBC Buildings – Bush House". The BBC Story. BBC. Retrieved 18 July 2012. 1 2 "BBC World Service leaves Bush House". BBC News. 12 July 2012. Retrieved 18 July 2012. ↑ "New Broadcasting House comes alive". News and Events. BBC. Retrieved 18 July 2012. ↑ "Bush House: BBC World Service moves home". BBC News. 12 July 2012. Retrieved 18 July 2012. ↑ Higham, Nick (12 July 2012). "BBC World Service leaves Bush House". BBC News. Retrieved 18 July 2012. ↑ Sabbagh, Dan (12 July 2012). "Bush House ceases BBC broadcasts after 71 years". The Guardian. Retrieved 18 July 2012. ↑ "BBC Radio news". Google. 1 2 "BBC News in Languages". BBC. Retrieved 18 July 2012. ↑ "How and When to Listen". BBC World Service. Retrieved 18 July 2012. ↑ "Annual Review 2008/2009". BBC News. Retrieved 8 April 2010. ↑ "Review of 2008–2010". How we spend our Budget. Foreign and Commonwealth Office. Retrieved 18 July 2012. ↑ "Promoting and protecting British interests overseas". Foreign and Commonwealth Office. Retrieved 18 July 2012. ↑ "Annual Review 2011/12" (PDF). BBC World Service. p. 9. Retrieved 18 July 2012. ↑ "BBC Learning English". BBC. Retrieved 3 October 2008. ↑ "75 Years – BBC World Service | Multi-lingual audio | BBC World Service". BBC. Retrieved 16 February 2011. ↑ History of International Broadcasting (IEEE), Volume I. ↑ ""BBC World Service Europe"". Archived from the original on 23 January 1998. Retrieved 2013-04-17. CS1 maint: BOT: original-url status unknown (link). BBC. 23 January 1998. Retrieved 17 April 2013. "Unfortunately, the Finnish Service was closed on the 31st December 1997." ↑ Kremer, Guntram. ""Epilog"". Archived from the original on 22 April 1999. Retrieved 2013-04-17. CS1 maint: BOT: original-url status unknown (link) . BBC World Service German. 22 April 1999. Retrieved 17 April 2013. "G.K. Der Deutsche Dienst der BBC wurde am 26 März 1999 geschlossen." ↑ "A fond farewell to BBC Serbian". BBC News. 26 February 2011. ↑ "BBC launches first social media-only news service – for Thailand". Retrieved 13 October 2014. ↑ Boaden, Helen (22 January 2007). "Editorial Processes – How BBC News works" (PDF). BBC Trust. p. 4. Retrieved 11 August 2012. ↑ "BBC WORLD SERVICE AND XM ANNOUNCE PROGRAMMING ALLIANCE" (Press release). XM Satellite Radio. 26 July 1999. Retrieved 17 October 2007. ↑ "BBC World Service Appoints American Public Media as New Distributor in the United States". APM. 12 July 2012. Retrieved 2 January 2013. ↑ Pages 1–136 from BBC AR Cover 03 Archived 2 February 2007 at the Wayback Machine. ↑ "BBC World Service | FAQ". BBC. 10 August 2005. Retrieved 16 February 2011. ↑ "Save the BBC World Service in North America and the Pacific! – BBC to Cut Off 1.2 Million Listeners on July 1". Savebbc.org. 6 June 2001. Retrieved 16 February 2011. ↑ "FAQ | World Service". BBC. Retrieved 16 February 2011. ↑ "Press Office – Falkland Islands and BBC to boost home-grown media". BBC. 23 February 2006. Retrieved 16 February 2011. ↑ Clare Harkey (13 March 2006). "BBC Thai service ends broadcasts". BBC News. Retrieved 8 November 2008. ↑ Vivien Marsh (28 March 2011). "BBC Chinese Service makes final broadcast in Mandarin". BBC. Retrieved 25 October 2011. ↑ Vivien Marsh (28 March 2011). "BBC Chinese Service makes final broadcast in Mandarin". BBC. Retrieved 13 March 2014. ↑ Ben Dowell (20 March 2011). "BBC World Service to sign funding deal with US state department". The Guardian. Retrieved 13 March 2014. ↑ "Press Office – Uzbek language broadcasts jammed". BBC. Retrieved 15 March 2014. 1 2 "House of Commons – Foreign Affairs: Written evidence from the BBC World Service". Publications.parliament.uk. Retrieved 15 March 2014. ↑ John Plunkett. "BBC condemns China's 'deliberate' jamming of World Service broadcasts | Media". theguardian.com. Retrieved 15 March 2014. ↑ "BBC World Service: The closure of 648 kHz medium wave". BBC. Retrieved 11 August 2012. ↑ "BBC Launches DRM Service in Europe". BBC World Service. 7 September 2005. Retrieved 15 November 2006. ↑ "Friends". worldservice.co.nz. Auckland Radio Trust. Retrieved 23 January 2016. ↑ "Home Page". worldservice.co.nz. Auckland Radio Trust. Retrieved 23 January 2016. 1 2 3 "What is the BBC World Service signature tune?". BBC. Retrieved 4 September 2010. 1 2 3 Robert Weedon (16 December 2009). "Audio Identities". Retrieved 4 September 2010. Wikimedia Commons has media related to BBC World Service.